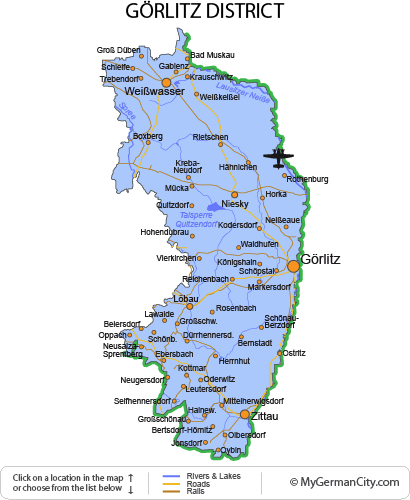 The eastern-most district in the whole of Germany is the Görlitz District in Saxony. It borders both Poland and the Czech Republic as well as southern Brandenburg. The river Neiße is the general border between the countries and follows the districts eastern edge. Görlitz is also the name of the capital city, which sits on the Polish border. Having been a wealthy member of the Lusatian League (a Sorbian institution) it has some amazing architecture, huge plazas and many merchant houses lining its busy streets. After World War II, many of the towns in the Görlitz district were affected by border changes. The capital city lost much of its land to its neighbor and the town of Ostritz’s main train station is now actually in Poland! Bad Muskau, however, embraced this and the great Park von Muskau (a UNESCO site) proves it. This vast red palace and extensive gardens sit on a huge “island” which is technically both German and Polish. Italian inspired Zittau also encourages cultural events and is regularly visited as a location on the Via Sacra — a European religious route.